Habit: Shrub in California. Leaf: alternate, sessile or petioled; blade long, entire or toothed, generally +- glandular. Inflorescence: heads 1 or in flat-topped or +- conic clusters, sessile or short-peduncled; involucre cylindric; phyllaries generally in 1 series, linear, keeled; receptacle flat, epaleate, short-hairy. Flower: 4--25+; corolla yellow, 2-lipped, outer lip spreading, resembling ray of ray flower, 3-lobed, sometimes recurved, inner lip deeply 2-lobed, recurved or coiled; anthers exserted, base with tail-like appendage, tip oblong, acute; style branch tips +- truncate. Fruit: +- cylindric, 5-ribbed, black or brown, short-hairy and glandular; pappus of many finely barbed bristles. Habit: Plant glandular and short-hairy. Stem: 2--20 dm, erect, stiff, much-branched. Leaf: many; petiole 1.5--5 mm, winged; blade 2--11 cm, lance-linear to lanceolate, acute at both ends, entire or serrate, margin often rolled under. Inflorescence: peduncle generally <= 5 mm, bearing 5--7 bracts; phyllaries 8--10, 8--14 mm, green, tips acute. Flower: 11--25; corolla glandular, tube 6--9 mm, outer lip 5--8 mm, spreading, inner lip 4--5.5 mm, generally coiled. Fruit: 6--10.5 mm; pappus 7.5--12 mm, dull white. Chromosomes: 2n=54. Unabridged Note: A 2nd variety in northwestern Mexico. Citation for this treatment: David J. Keil 2012, Trixis californica var. californica, in Jepson Flora Project (eds.) 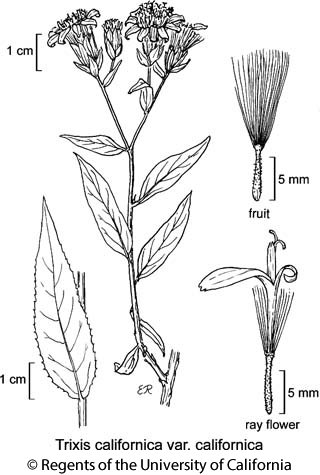 Jepson eFlora, http://ucjeps.berkeley.edu/eflora/eflora_display.php?tid=76328, accessed on April 26, 2019.
se DMoj, DSon; Markers link to CCH specimen records. Yellow markers indicate records that may provide evidence for eFlora range revision or may have georeferencing or identification issues. Purple markers indicate specimens collected from a garden, greenhouse, or other non-wild location.